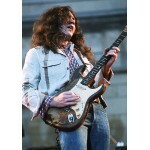 William Rory Gallagher,2 March 1948 – 14 June 1995,was an Irish blues-rock multi-instrumentalist, songwriter, and bandleader. Born in Ballyshannon, County Donegal, Ireland,and raised in Cork, Gallagher recorded solo albums throughout the 1970s and 1980s, after forming the band Taste during the late 1960s. A talented guitarist known for his charismatic performances and dedication to his craft, Gallagher's albums have sold in excess of 30 million copies worldwide.Gallagher received a liver transplant in 1995, but died of complications later that year in London, England aged 47.